This beautiful lectern podium pulpit is made from MDF and acrylic. Features 3/4" MDF base side panels and shelf with nice walnut color. Large front panel covered with clear acrylic and decorative caps. Top panel is 1/2" acrylic! 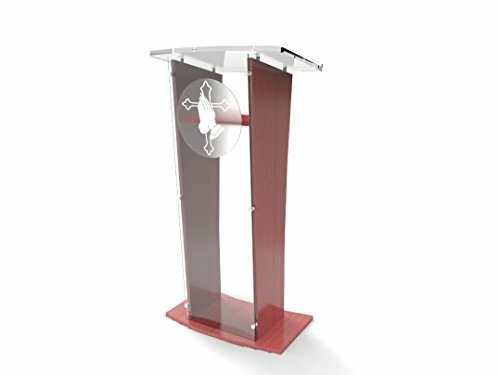 Ideal for church, hotels, universities, colleges and conference centers, where a outstanding acrylic, podium, pulpit, lectern. Features slanted book Bible stop. MDF and acrylic combination fit any environment. Larger rectangular base for excellent stability. Podium stands 48" tall, 24" wide and 17" deep. Designed to ship flat and offers best value and utility. Set up instructions provided. Video link provided. Like any IKEA furniture easy to put together. We can also ship with unit fully assembled. Please find detail info at the bottom for Additional Options. Fast shipping! Manufacturer direct to provide most competitive price! The white cross is sold separately. Be sure to browse for more details on the cross. Must be in original packaging.